The Sunday School in Mealsgate was associated with the Memorial Hall in Mealsgate from its early days. The Sunday School Union founded in London in 1803, was an organisation to which George Moore left the large sum of £500 in his will. The name 'The Memorial Hall Sunday School' was adopted in 1889 according to an entry dated 17 June 1889 in the Memorial Hall Minute Book for that year. The above image and the one below kindly provided by Mick Jane. 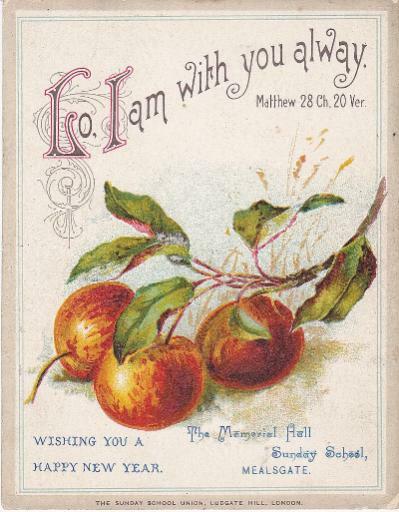 This New Year Card on the left dates, I believe, to circa 1895 and was printed by 'The Sunday School Union', Ludgate Hill, London. The Sunday School Union was an important publisher of religious material as well as books and other materials relating to temperance and sobriety. We know from entries in the Fletchertown School Log that the Sunday School met in The George Moore Memorial Hall in the 1890s and early 1900s. There is also much discussion recorded in the Memorial Hall Minute Book about when the Sunday School should be permitted to meet and how much they should be charged for the use of the Hall. The fee of 20 shillings per annum being agreed to in 1880. Below is a scan of the reverse of the card on which is printed an annual programme of subjects to be addressed at Sunday School Meetings. 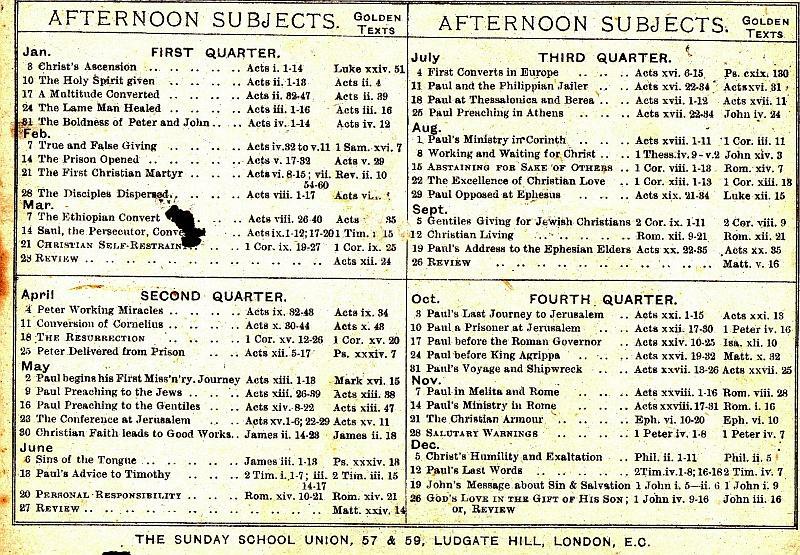 By my calculation, given the dates, this calendar of 'Afternoon Subjects' is likely to be for the year 1892 or 1897. Wesleyan Methodists and Rechabite group photographs have also been taken on the steps of the Memorial Hall so one presumes these groups also met in the Hall. The Independent Order of Rechabites was a Friendly Society founded in 1835 and part of the wider temperance movement promoting total abstinence from alcohol consumption. According to the Memorial Hall's Minute Book for 1880, The Band of Hope, an organisation founded in Leeds in 1847 to teach children the importance and principles of teetotalism also met in the Hall and paid 10 shillings a year for the privilege and another temperance society known as The Good Templars, aka IOGT (Independent Order - later Organisation of Good Templars), a society founded in New York in 1851 that spread to England in 1868, also met in The George Moore Memorial Hall.